The UBC-Langara Aboriginal Transfer Partnership is a collaboration between the University of British Columbia and Langara College that offers First Nations, Métis, and Inuit students a clear pathway to a UBC degree. Through the Partnership, you’ll gain access to scholarships and awards, personalized advisor and faculty guidance, and the academic and personal preparation required to successfully transition from Langara to life on UBC’s Vancouver campus. Located on the shoreline of the Salish Sea, the Museum of Anthropology is home to one of the world’s finest collections of Northwest Coast First Nations artwork. The AMS Student Nest is a great spot to study, meet up with friends, or grab a bite to eat between classes on UBC's Vancouver campus. A powwow dancer at the Annual Nehiyopaskwaitsimowin Powwow, a student-led event organized by the Indigenous Student Association and the First Nations Studies Student Association at UBC. Living in residence at UBC puts you close to classes and on-campus resources like the Aboriginal Centre and First Nations Longhouse. You must have successfully completed a BC secondary program (Grade 12) or equivalent. You must be at least 19 years of age on the first day of your first semester. You must have successfully completed an Adult Basic Education (ABE) or General Educational Development (GED) program. When you’re ready, submit your completed form to the Indigenous Gathering Space (Room A167) at Langara. If you are unable to drop off your form during business hours, please email aboriginal@langara.ca. When Laura started out at Langara College, she already had her sights set on law school. 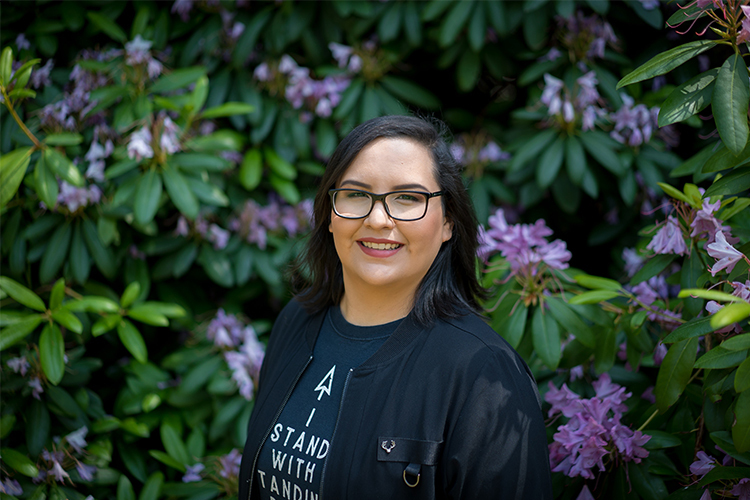 Now a UBC Centennial Leaders Entrance Award winner and fourth year Anthropology student on the Vancouver campus, she looks back at her journey from Langara to UBC through the Aboriginal Transfer Partnership. "Reading through the criteria on the Aboriginal Transfer Partnership application, I couldn’t see a reason not to sign up." Meet with Langara’s Aboriginal Liaison Counsellor to create a transition plan. Once you have a transition plan in place, request a statement of completion from Aboriginal Services to submit as part of your UBC application. To get started, please email aboriginal@langara.ca. As a Langara transfer student, you must meet UBC’s general admission requirements for transfer students from a Canadian college and your chosen faculty’s specific requirements on the Vancouver campus before applying to UBC. It takes two semesters of full-time study to earn 24 credits, so most students spend one or two years at Langara. Scroll to find your faculty-specific requirements at UBC. Complete the Engineering Transfer Program with a GPA of 2.8 or higher. Complete the Engineering Transfer Program within a 24-month period ending no later than April 30 in the same year as your September start at UBC. Complete a minimum of 24 transferable credits, at least 18 of which must be from Langara. Achieve a GPA of 2.67 or higher on your 24 most recent transferable credits attempted, including courses you’ve failed or re-taken. If you’ve attempted more than 24 transferable credits, your average will be based on your 30 most recent transferable credits. If the competitive GPA is lower than 2.67 in a given year, you’ll be evaluated against the lower average. Complete the Writing Component (WRDS 150, ENGL 100, or equivalent) with a final grade of C+ (2.33 on the Langara grading scale) or higher. Complete at least 30 credits and no more than 60 credits. Achieve a GPA of 2.20 or higher on your 30 most recent transferable credits attempted, including courses you’ve failed or re-taken. Complete high school prerequisites or the equivalent in approved university-transferable coursework. Complete at least 48 credits, and no more than 60 credits, within the last four years. If you’ve completed 54 credits or more, including all first-year requirements (except LFS 100), you may be eligible for third-year standing. Achieve a GPA of 2.67 or higher on your 30 most recent transferable credits attempted, including courses you’ve failed or re-taken courses. If the competitive GPA is lower than 2.67 in a given year, you’ll be evaluated against the lower average. Complete at least 48 credits and no more than 60 credits. Achieve a GPA of 2.67 or higher on your 30 most recent transferable credits attempted, including courses you’ve failed or re-taken. Complete MATH 100 or equivalent. Complete at least 24 transferable credits. Achieve an academic average of 2.67 or higher on your 30 most recent transferable credits attempted, including courses you’ve failed or re-taken. If the competitive GPA is lower than 2.67 in a given year, you’ll be evaluated against the lower average. Complete the required courses for year 2 or year 3 entry. Achieve a GPA of 2.67 or higher on your 30 most recent transferable credits attempted, including courses you’ve failed or re-taken. If the competitive GPA is lower than 2.67 in a given year, you’ll be evaluated against the lower average. Year 2 entry: All transferable Economics and English courses, plus required Math (Differential Calculus) courses. Year 3 entry: All transferable, Commerce-equivalent courses. Submit a BCom Personal Profile. As a student in the UBC-Langara Aboriginal Transfer Partnership, you’ll have access to the financial advising services, scholarships, bursaries, and other assistance available to all students at Langara and UBC. You’ll also have access to the following awards, which are available exclusively to students enrolled in the Partnership. If you are an Aboriginal student of Canada who is pursuing an undergraduate degree at UBC in the Faculty of Applied Science (Engineering), the Faculty of Arts, the Faculty of Forestry, the Faculty of Kinesiology, the Faculty of Land and Food Systems, the Faculty of Science, or the UBC Sauder School of Business, there are awards ranging in value from $1,500 to $2,500 available from UBC. Demonstrate academic achievement and community engagement. All eligible candidates will be automatically considered. If you are an Aboriginal student of Canada who is transferring from Langara to UBC to pursue an undergraduate degree in the Faculty of Applied Science (Engineering), the Faculty of Arts, the Faculty of Forestry, the Faculty of Kinesiology, the Faculty of Land and Food Systems, the Faculty of Science, or the UBC Sauder School of Business, there are $2,500 entrance scholarships available from UBC. Register in a minimum of 24 credits during your first Winter Session at UBC. If you are an academically qualified student who would be unable to attend UBC without significant financial assistance, you could be eligible for a one-time or renewable award (up to $40,000 over four years) or a full-ride award for the full cost of your degree and living expenses (up to $80,000 over four years). Ready to earn a UBC degree? Begin your journey at Langara.